The wrist is the latest battleground for the technologically-forward end user. You’ve got your tablet, your smartphone, your computer, and even your eyeglasses are connected to the Internet and are more capable than ever, but what about your wrist? There are already some smartwatches available, but it won’t really matter until Apple’s got its entry on the market. Apple’s patent for the iWatch has been revealed, meaning the product is closer to real than ever. “As an electronic wristband to be worn on a wrist of a user, one embodiment of the invention can, for example, include at least a central portion and at least one band portion. The central portion can have a receptacle area configured to receive a mobile electronic device. The mobile electronic device can include a display and be independently useable apart from the electronic watchband. 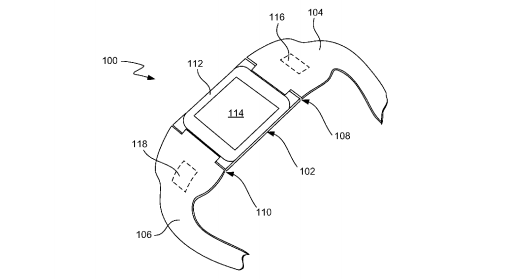 The least one band portion can be coupled to central portion and suitable to assist with securing the electronic wristband to the wrist of the user,” reads the patent, filed 3 years ago. Just think, a device the size of a watch that has all the power of the cloud and access to pretty much everything you’ve got out in the world. Of course, there’s already phones, but apparently those are too big. Something watch-sized is much more my speed.